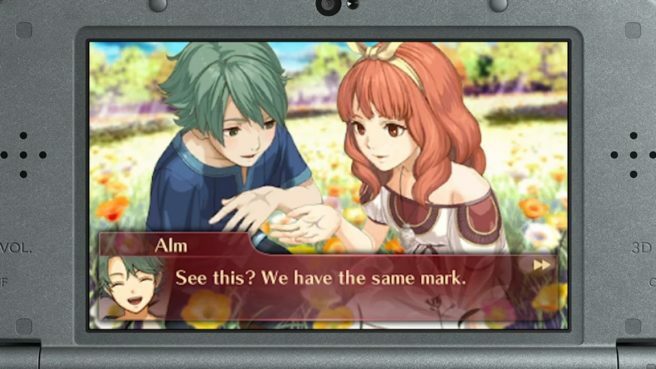 Fire Emblem Echoes: Shadows of Valentia makes full use of voice acting. It’s true that past entries have had voice over before, but with the 3DS remake, characters are entirely voiced. This may not be a one time thing, as Intelligent Systems director Toshiyuki Kusakihara has expressed interest in bringing it back in the future. Italian site Multiplayer.it asked Kusakihara if the full voice acting will return in the future. To that, he did in fact say that he hopes to bring it back in future releases. Continue on below for our full translation of this particular question / answer. Fire Emblem Echoes is the only Fire Emblem in which you can explore dungeons in third person. It’s an interesting mechanic that has entertained us a lot. Furthermore, it has surprised us that you have decided to voice (literal “dub”) every dialogue line: should we expect dungeons and a complete voice over again in the next Fire Emblem games? Toshiyuki Kusakihara: We thank you for your compliment. To tell the truth, we wanted to implement dungeons even in Fire Emblem Fates, but in the end we didn’t succeed. We wanted to make it possible to explore castles in third person, but we had to opt for looking around in a fixed position. Dungeons were already present in Fire Emblem Gaiden and when we discussed how to implement them in the remake we looked back to Fire Emblem Fates and managed to realize what we had hoped to do then. Furthermore​, Fire Emblem Gaiden has many characteristics of a traditional RPG, so the dungeons integrate well. As for the voice acting, Fire Emblem Echoes is the first title that we have dubbed completely and it wasn’t that easy. In the end, we were satisfied because the fully voiced dialogue can help make characters be better understood, and I hope to repeat the experience for future games. Thanks to ToniCodrea for helping us out with the native translation.